Butternut Mountain Farms Organic Pure Maple Syrup, Grade B - 1 Gallon by Butternut Mountain Farm at Rae Of Sunshine Life. Hurry! Limited time offer. Offer valid only while supplies last. 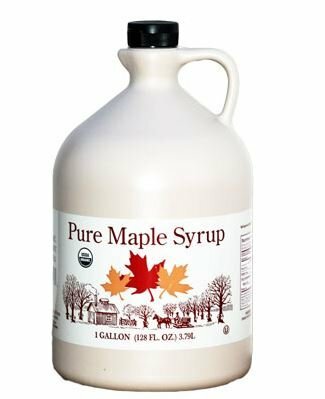 Pure maple syrup is a natural, essentially wild, crafted product made by boiling down the sap of maple trees. No additives or preservatives are used. Pure maple syrup is a natural, essentially wild, crafted product made by boiling down the sap of maple trees. No additives or preservatives are used. Grade B maple syrup has a strong maple flavor and slight caramel taste and a dark color. Grade B is preferred by some for table use, and its strong flavor makes it best for cooking. It is the darkest consumer grade available. Minerals and Vitamins: Maple syrup also contains minerals and vitamins. Filtered maple syrup's primary minerals are: calcium, potassium, magnganese, magnesium, phosphorus, and iron. The vitamins in maple syrup are mainly B2 (riboflavin), B5 (pantothenic acid), B6 (pyridoxine), niacin, biotin, and folic acid. Sugars: The main sugar in pure maple syrup is sucrose though maple syrup also contains small, variable amounts of fructose and glucose. In order of sweetness, sucrose is less sweet than fructose and sweeter than glucose. About the Producers: For the last 35 years, David, with the help of his wife Lucy, has grown Butternut Mountain Farm into what it is today a Vermont company known around the world for producing award-winning maple products. The heart of Butternut Mountain Farm really is a farm. Located on a hillside 1000 ft above the village of Johnson at the end of three miles of rough dirt road is the 600 acre tree farm that the Marvin family has stewarded for more than half a century. To ensure adequate supply for customers, the Marvin family has also built long-term relationships with other producers who share a vision of forest stewardship. "We know maple from soil to roots, trunk and twigs, from historic to modern technology, from sap chemistry to flavor analysis, from bulk value to value-added... Look inside our process for making the high-quality maple products for which we're internationally known." Since 1940, the Marvin family has been deeply involved in the science, research, art and practice of sugaring. View More In Breakfast Syrups & Toppings. If you have any questions about this product by Butternut Mountain Farm, contact us by completing and submitting the form below. If you are looking for a specif part number, please include it with your message.